Results from the DRCR.net’s Protocols S and T lend insights on the management of these conditions in clinical practice. 400 ophthalmologists at 135 clinical centers in 37 states. The network is funded by the National Eye Institute and conducts randomized clinical trials (RCTs) and other studies on the treatment of diabetic retinopathy and related pathologies, including diabetic macular edema (DME) and proliferative diabetic retinopathy (PDR). To date, the DRCR.net has implemented 20 protocols (Protocols A through T). Recently, the results from two major protocols were published, providing retina specialists with important new information regarding the pharmacologic treatment of PDR (Protocol S) and DME (Protocol T).1 This information can be applied in clinical practice to help us offer better outcomes and experiences for patients. • In light of the findings of DRCR.net Protocol S, patients with PDR treated only with anti-VEGF therapy may require indefinite and possibly lifelong monitoring to a much greater degree than those treated with PRP. •For patients with PDR, although the results of Protocol S appear to favor the use of ranibizumab over PRP, there are many concerns with a purely pharmacologic approach. • Although there may be reason to prefer one anti-VEGF drug over another for the treatment of center-involved DME, all three agents investigated in Protocol T were beneficial for most patients. Some retina specialists do not follow the recommendations of an RCT when treating patients in their own clinical practice for a number of reasons. An RCT may have had patient inclusion and exclusion criteria that were relatively strict regarding patient age, best corrected visual acuity (BCVA), disease severity, comorbid conditions, prior treatments, etc., and many patients seen in clinical practice may not have been eligible for that trial. The RCT may have employed testing procedures such as ETDRS visual acuity charts and measurement protocols or interventions that are inaccessible to or impractical for ophthalmologists to implement in clinical practice. The RCT may have determined that a certain treatment was associated with a statistically significant result that is not clinically meaningful for an individual patient. Certain treatments may be too expensive for some patients, especially those with limited or no medical insurance. And, as always, there is an important role for discussion among the treating ophthalmologist and the patient and his or her family members when selecting a therapeutic option. In this article we recap the findings of DRCR.net RCT Protocols S and T and attempt to frame them for the real-world clinical practice setting. Protocol S compared panretinal photocoagulation (PRP) with ranibizumab 0.5 mg (Lucentis, Genentech) for the treatment of PDR.2 The trial recruited 394 eyes of 305 patients. Inclusion criteria included age 18 years or older, type 1 or type 2 diabetes mellitus, at least one eye with BCVA of 20/320 or better, PDR with or without DME, and no prior PRP. The primary outcome measure was mean change in BCVA at 2 years. Patients were randomly assigned to receive PRP over one to three sessions or intravitreal injections of ranibizumab. Injections were performed every 4 weeks through 12 weeks, then as needed using predefined criteria. Rescue treatment with PRP and/or pars plana vitrectomy (PPV) was allowed using prespecified criteria. Patients assigned to receive PRP could also receive ranibizumab for treatment of concomitant DME. During the course of the study, 53% of eyes assigned to receive PRP also received ranibizumab for treatment of DME. In addition, 45% of eyes in the PRP group were subsequently treated with additional PRP, at a mean of 7 months after completion of initial treatment. Only 6% of eyes in the ranibizumab group subsequently received PRP, most during PPV. At 2 years, the mean improvement in BCVA was 2.8 ETDRS letters in the ranibizumab group and 0.2 ETDRS letters in the PRP group, demonstrating that ranibizumab, as investigated, was noninferior to PRP. Further, ranibizumab was associated with more eyes achieving 10 or more ETDRS letters of BCVA improvement and fewer eyes experiencing 10 or more ETDRS letters of worsening compared with PRP at all time points investigated. There were no significant differences in rates of retinal detachment, neovascular glaucoma, iris neovascularization, or vitreous hemorrhage between the two groups. The rate of PPV was significantly higher in the PRP group (15%) than in the ranibizumab group (4%). Protocol T compared three anti–VEGF agents—ranibizumab 0.5 mg, aflibercept 2.0 mg (Eylea, Regeneron), and bevacizumab 1.25 mg (Avastin, Genentech)—for the treatment of DME.3 The study recruited 660 patients. 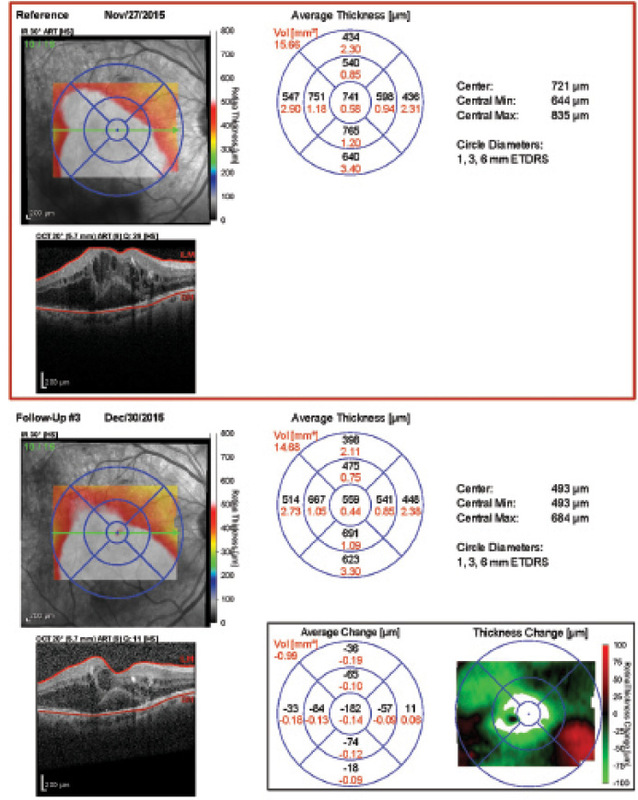 Inclusion criteria included age 18 years or older, type 1 or type 2 diabetes mellitus, and at least one eye with BCVA of 20/32 to 20/320, with center-involved DME on examination and optical coherence tomography (OCT), and with no anti-VEGF treatment within the previous 12 months. The OCT eligibility thresholds were central subfield thickness (CST) of 250 µm or greater as measured with Stratus OCT (Carl Zeiss Meditec), 305 µm or greater for men and 290 µm or greater for women as measured with Cirrus HD-OCT (Carl Zeiss Meditec), or 320 µm or greater for men and 305 µm or greater for women as measured with Spectralis (Heidelberg Engineering). The primary outcome measure was mean change in BCVA at 1 year. Patients were randomly assigned to receive one of the three anti-VEGF agents. Follow-up was every 4 weeks for 1 year, then every 4 to 16 weeks based on predefined criteria. Improvement was defined as an increase in BCVA letter score by 5 or more (about 1 Snellen line) or a decrease in CST by 10% or more. Worsening was defined as a decrease in BCVA letter score by 5 or more or an increase in CST by 10% or more. During the first 24 weeks, patients received an anti-VEGF injection at every visit unless BCVA was 20/20 or better, with CST below the eligibility threshold and with no improvement or worsening in response to the previous two injections. After 24 weeks, an injection was not performed if there was no improvement or worsening after two consecutive injections, but injections were resumed if BCVA or CST worsened. Finally, patients with persistent DME at or after 24 weeks, based on predefined criteria, were treated with focal/grid photocoagulation. About half of the enrolled patients had baseline BCVA between 20/32 and 20/40, and about half of the enrolled patients had baseline BCVA of 20/50 or worse. For patients with a presenting BCVA between 20/32 and 20/40, there were no significant differences in BCVA improvement at 1 year among the three anti-VEGF treatment groups, although aflibercept was associated with the greatest mean reduction in CST (statistically significantly greater than bevacizumab, difference nonsignificant for ranibizumab). For patients with a presenting BCVA of 20/50 or worse, aflibercept was associated with a significantly greater mean improvement in mean BCVA than the other two drugs (4.7 letters over ranibizumab, 7.1 letters over bevacizumab). The 2-year results of Protocol T were published this year.4 Similar to the 1-year results, patients with better presenting BCVA achieved similar visual improvement with all three drugs at 2 years; aflibercept was again associated with the greatest mean reduction in mean CST. In patients with a presenting BCVA of 20/50 or worse, aflibercept was still associated with the greatest mean BCVA improvement, although the incremental difference was less than at 1 year and was no longer statistically significant (2.0 letters over ranibizumab, 4.8 letters over bevacizumab). In the treatment of patients with PDR, PRP is often used once or a few times, whereas anti-VEGF therapy typically requires multiple injections over an indefinite timeframe. In Protocol S, PRP was administered in as few as one and as many as three sessions, and most of these patients did well with no further intervention. By contrast, the average patient without DME at baseline assigned to ranibizumab treatment received 10 injections over 2 years. These injections are associated with additional clinic visits, increased costs, and injection-related risks such as endophthalmitis. In Protocol S, one eye developed endophthalmitis, which resulted in an endophthalmitis rate of 0.04% per injection and 0.33% per eye over 2 years. The number of injections needed beyond 2 years to maintain involution of PDR is unknown. Therefore, patients with PDR treated only with anti-VEGF therapy may require indefinite and possibly lifelong monitoring to a much greater degree than those treated with PRP. Noncompliance and losses to follow-up are of much greater concern with the pharmacologic approach. Figure. A 59-year-old man with type 2 diabetes mellitus and quiescent PDR (status post PRP) presented with DME and visual acuity of counting fingers in the right eye (A). The patient was treated with bevacizumab. OCT at 1 month after treatment (B) demonstrated a reduction in intraretinal and subretinal fluid. Pharmacologic therapy has largely replaced photocoagulation in the treatment of patients with center-involved DME.5 Protocol T provides much information about relative differences in outcomes associated with different anti-VEGF agents, but no information related to corticosteroid use, despite the fact that two steroid agents have been approved by the US Food and Drug Administration for the treatment of DME and another steroid has been used extensively off-label for this purpose.6 These drugs may be beneficial for certain patients, specifically pseudophakes, patients without a history of intraocular pressure elevation associated with steroid use, those wishing to decrease their treatment burdens, and possibly pregnant patients. Protocol T reported a small but statistically significant advantage associated with aflibercept compared with ranibizumab and bevacizumab at 1 year. Aflibercept was associated with the greatest mean BCVA improvement among patients with presenting BCVA of 20/50 or worse at 1 year, although this advantage diminished and was no longer statistically significant by year 2. In addition, the mean decrease in CST as measured with OCT was greatest with aflibercept at all time points, demonstrating an anatomic benefit with this agent. However, as discussed above, this may represent an example of a statistically significant difference that is not clinically meaningful for an individual patient. For patients with PDR, although the results of Protocol S appear to favor ranibizumab over PRP as used in the study, there are many concerns with a purely pharmacologic approach. Protocol S tested ranibizumab, which is not FDA-approved for this indication and may not be reimbursed by insurance providers. Therefore, most clinicians will probably use bevacizumab in this situation. We suggest that anti-VEGF therapy is useful for certain patients with PDR but that most patients are likely best served by traditional PRP. Specific circumstances favoring initial anti-VEGF therapy with deferral of PRP might include patients with vitreous hemorrhage or other media opacity precluding PRP and patients with concomitant PDR and DME, in order to avoid exacerbation of DME with PRP. 1. Heier JS, Bressler NM, Avery RL, et al; American Society of Retina Specialists Anti-VEGF for Diabetic Macular Edema Comparative Effectiveness Panel. Comparison of aflibercept, bevacizumab, and ranibizumab for treatment of diabetic macular edema: extrapolation of data to clinical practice. JAMA Ophthalmol. 2016;134(1):95-99. 2. Writing Committee for the Diabetic Retinopathy Clinical Research Network; Gross JG, Glassman AR, Jampol LM, et al. Panretinal photocoagulation vs intravitreous ranibizumab for proliferative diabetic retinopathy: a randomized clinical trial. JAMA. 2015;314(20):2137-2146. 3. Diabetic Retinopathy Clinical Research Network; Wells JA, Glassman AR, Ayala AR, et al. Aflibercept, bevacizumab, or ranibizumab for diabetic macular edema. N Engl J Med. 2015;372(13):1193-1203. 4. 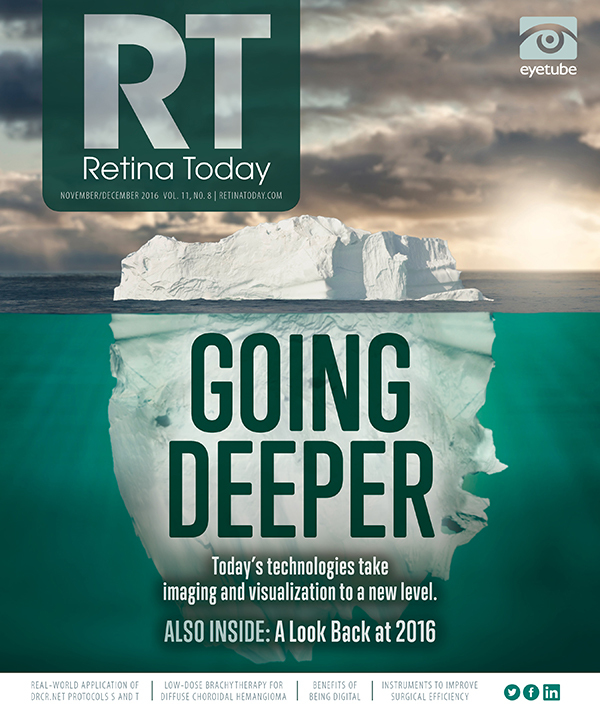 Wells JA, Glassman AR, Ayala AR, et al; Diabetic Retinopathy Clinical Research Network. Aflibercept, bevacizumab, or ranibizumab for diabetic macular edema: two-year results from a comparative effectiveness randomized clinical trial. Ophthalmology. 2016;123(6):1351-1359. 5. Stewart MW, Flynn HW Jr, Schwartz SG, Scott IU. Extended duration strategies for the pharmacologic treatment of diabetic retinopathy: current status and future prospects. Expert Opin Drug Deliv. 2016;13(9):1277-1287. 6. Schwartz SG, Scott IU, Stewart MW, Flynn HW Jr. Update on corticosteroids for diabetic macular edema. Clin Ophthalmol. 2016;10:1723-1730. 7. Ross EL, Hutton DW, Stein JD, et al; Diabetic Retinopathy Clinical Research Network. Cost-effectiveness of aflibercept, bevacizumab, and ranibizumab for diabetic macular edema treatment: analysis from the Diabetic Retinopathy Clinical Research Network comparative effectiveness trial. JAMA Ophthalmol. 2016;134(8):888-896.
and medical director, Bascom Palmer Eye Institute at Naples, Fla.
College of Medicine, Hershey, Pa.